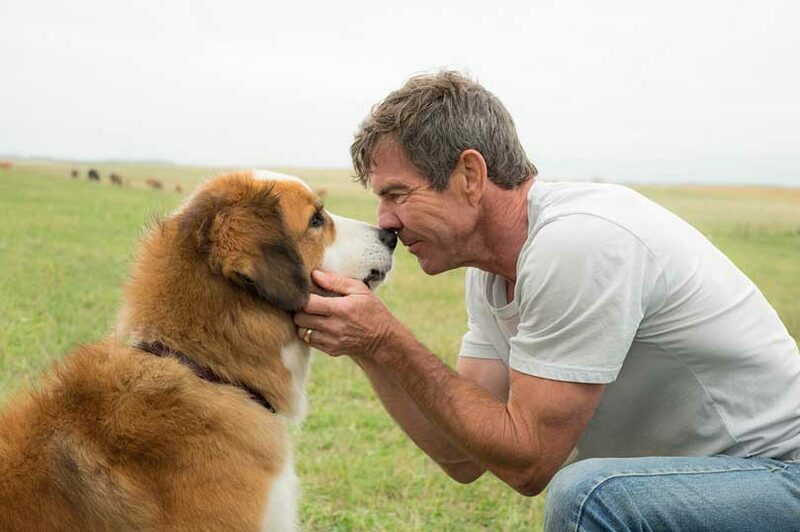 A Dog’s Purpose is adapted for the screen by Cameron & Cathryn Michon (Muffin Top: A Love Story) and Audrey Wells (Shall We Dance) and Maya Forbes (Infinitely Polar Bear) & Wally Wolodarsky (Diary of a Wimpy Kid: Dog Days). A Joyous Concept: What Is a Dog’s Purpose? After its publication in 2010, “A Dog’s Purpose” became an enormous hit, finding an audience with animal lovers across the globe who were charmed by its tender, poignant and humorous take on what our animal companions think of us and why they are truly here. The No. 1-New York Times Best-Selling book spent more than one year on that list and has been translated into 20 languages, and published in 29 different countries worldwide. It even spawned a sequel, “A Dog’s Journey,” which was published in 2012 and achieved similar acclaim. The series author, W. Bruce Cameron, is well known as the writer of the best-selling humor tome “8 Simple Rules for Dating My Teenage Daughter.” The book was adapted into a hugely popular ABC sitcom, which starred the late John Ritter, and Katey Sagal and introduced the world to The Big Bang Theory’s Kaley Cuoco. Producer Gavin Polone read “A Dog’s Purpose” while it was still in galley form, and at the request of Cameron and Michon, he would shepherd it through the development process. During this time, it drew the attention of Amblin Entertainment. “We wanted to find a producer to take the book to the next step, and Gavin has such a great reputation for protecting writers, so we sent the book to him,” reveals Cameron. In their mission to find a champion to take the book to the next step, they needed a director that would have the same goal in mind. While Cameron and his fellow script writers had to create rules for our story—in terms of what the dog was thinking and could process—Hallström also had to keep things logical…in what some might say is an illogical notion. One of the world’s most renowned directors, LASSE HALLSTRÖM (Directed by) is best known to audiences as the maker of such poignant but resolutely unsentimental films as My Life as a Dog, What’s Eating Gilbert Grape and The Cider House Rules. The son of an amateur filmmaker, Hallström was born in Stockholm on June 2, 1946. He began his professional career in high school when, with the assistance of a group of friends, he made a short film about some schoolmates who had formed a band. In 1975, Hallström made his debut with the romantic drama A Guy and a Gal. Two years later, he focused his lens on one of Sweden’s most famous exports in ABBA: The Movie. He subsequently made a number of romantic comedies; but it was not until 1985, with My Life as a Dog, that Hallström had his international breakthrough. A bona fide art-house hit, My Life as a Dog was the touching and wholly un-patronizing coming-of-age story of a young boy sent to live with relatives when his terminally ill mother can no longer care for him. The film earned a score of international honors, including the Best Foreign Film at the Golden Globe Awards and a New York Film Critics Circle award. Hallström received Oscar nominations for Best Director and Best Adapted Screenplay. BRUCE CAMERON (Based on the Novel by/Screenplay by) is a Benchley award winner for humor and was named the 2011 Columnist of the Year by the National Society of newspaper Columnists. He has written for television (8 Simple Rules, based on his book) and co-wrote the feature film Muffin Top: A Love Story, which was released in November 2014. He produced and co-wrote the feature film Cook-Off!, which is in postproduction. His novel “A Dog’s Purpose” spent 52 weeks on The New York Times Best Sellers list. The sequel, “A Dog’s Journey,” was published in May 2012, and was instantly a The New York Times Best Seller. Cameron has been a guest on Good Morning America, Fox & Friends, The Today Show, Oprah, Anderson Cooper and CBS This Morning. In 2017, “A Dog’s Way Home” will be published in May, the humor book “A Dad’s Purpose” will be published in June and the young readers novel “Molly’s Story” came out in September. CATHRYN MICHON (Screenplay by) is a screenwriter, actress and feature film director, as well as the author of the best-selling “Grrl Genius” book series. An alumna of The Second City, she has written for numerous Primetime Emmy Award-winning television series. She co-wrote, co-directed and stars in the upcoming Lionsgate ensemble feature comedy Cook-Off!, which also stars Wendi McLendon-Covey, Melissa McCarthy and Gary Anthony Williams. Michon also directed, co-wrote and starred in the award-winning indie film Muffin Top: A Love Story with David Arquette, currently on Netflix. AUDREY WELLS (Screenplay by) is a screenwriter and film director from San Francisco, California. She is the writer and director of Under the Tuscan Sun, which starred Diane Lane. She also wrote and directed Guinevere, which starred Sarah Polley and Stephen Rea, for which she won the Waldo Salt Screenwriting Award at the Sundance Film Festival and the jury prize at the Deauville Film Festival. Wells wrote the original screenplays for The Truth About Cats & Dogs and The Kid. Other writing credits include George of the Jungle, The Game Plan and the American adaptation of Shall We Dance. Wells is currently adapting The Hate U Give for director George Tillman Jr. and Fox 2000, and writing an original animated feature screenplay for Oriental DreamWorks. Wells serves as a visiting professor in the Graduate School of Theater, Film and Television at UCLA. MAYA FORBES (Screenplay by) began her career writing for The Larry Sanders Show. She has since written numerous television episodes and feature films. Her television credits include The People vs. O.J. Simpson and her film credits include Monsters vs. Aliens and Diary of a Wimpy Kid: Dog Days. All of these she co-wrote with her husband, Wally Wolodarsky. Forbes was named one of Variety’s “10 Directors to Watch” for her directorial debut Infinitely Polar Bear, which starred Mark Ruffalo and Zoe Saldana. Her latest project The Polka King, written and directed with Wolodarsky, stars Jack Black and will premiere at the Sundance Film Festival in 2017. WALLY WOLODARSKY (Screenplay by) began his career as a writer on The Tracey Ullman Show. He received a Primetime Emmy Award for his work. Wolodarsky was an original writer and producer on The Simpsons for the first four seasons, where he won his second Primetime Emmy Award. He has directed three features and has written several features with his wife Maya Forbes. The Polka King is the first feature they have written and directed together.